Water Bottles - View our range of Stand Mixers here at Anthony Ryans cookware shop, offering excellent quality Water Bottles to suit your needs. For beautiful skin we all know that consuming plenty of water is a must. However we all struggle to stay up with the recommend 2 litres intake of water a day. In addition the cost of buying bottles of spring water is simply unnecessary and a waste of money. The drinking products featured here are clever ways to help you with your water intake and hydration regime. The latest craze water infusing is also possible with the Polar Gear infuser bottle by popping in your citrus fruits to your water and this then helps the detox and purification process. 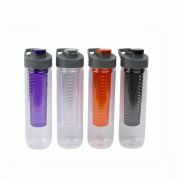 These bottles and seal closed so it is handy to have in fridge or mobile to take with you anywhere, whether that is the gym or the office or simply out walking. Bobble offer water bobbles that have filter spouts and will filter water while you drink. Bobble also have jugs that will filter tap water and store it until you are ready to use it and will fit neatly in your fridge so that you literally have ice cold spring water on tap and all for free. But don’t forget to change your filters when necessary.